Represented M.C.C. Baseball Section from 1934-1953, S.C. Lansdown VBA best & fairest 1940, Victorian Baseball Team 1938-1947. All Australian team 1946. Colin Chapman Miller (4th March 1916 ~ 13 April 2007) was one of one of nature’s true gentlemen and will be sadly missed. He was a member of the MCC Baseball Section from 1934 to 1953 and was a part of a side that was as strong as any in its history, he was a member of the side that was runners-up in 1938 and 1939 and won the premiership or championship every year from 1942 to 1946. A versatile player for the club and a grand clubman, he won the Lansdown Medal for the fairest and best player in the VBA competition in 1940. He finished runner up in the Lansdown medal in 1941 missing out by a single vote as Colin was in Army Camp and was only permitted leave every second weekend. Starting his baseball career with the Northcote Baseball Club in 1929 aged 13 playing in the seconds, playing 1st grade regularly from 1931 onwards. 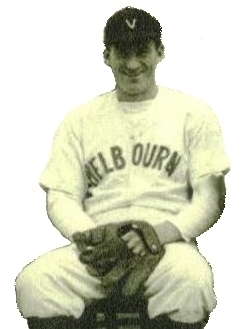 Col’s talents were recognized by the Melbourne Baseball Club where he played the top grade for several years from 1934 until the early 1950’s, culminating in his selection in the Claxton Shield team in 1938 and was a regular member in every Interstate carnival until 1947. Involved in baseball for more than 70 years, Col was a respected friend and mentor to many, within the MCC Baseball Section and the Preston Baseball Club. In the fifties Col transferred to Preston Baseball Club as coach, to pass on the skills and knowledge that had made him a much respected player and all round sportsman. Col was also a member of the first VBA Pennant Committee, which he served for 12 years. Founding Member Preston Football/Cricket Social Club.